Attendees of 2016 AnimeKon in Barbados. 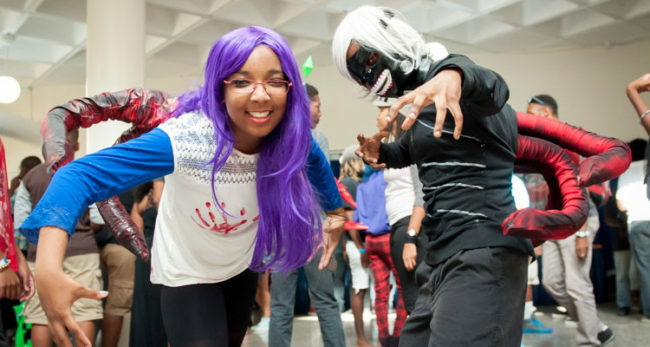 AnimeKon 2016, one of the Caribbean’s largest celebrations of Geek and Pop Culture took place August 27-28. Thousands of people came from all over the world to attend the two-day convention which was held at the Lloyd Erskine Sandiford Centre in Bridgetown, Barbados. This year ‘s convention theme was Quantum Age and featured more than 100 vendors displaying the latest in geek, fan, film and gaming culture. AnimeKon 2016 featured the talents of actor/comedian Phil LaMarr, the voice of Samurai Jack and the Metal Gear video game franchise. 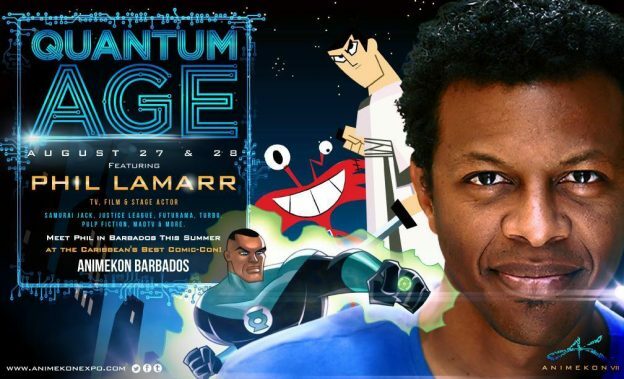 Advertisement featuring Phil LaMarr for AnimeKon 2016. Other celebrities included Kelly Yu who plays Yuriko Oyama a.k.a.Lady Deathstryke in the blockbuster sci-fi film, X-MEN 2; novelist/screenwriter Tim Wagoner (Like Death, Supernatural, X-Files); Chaka Cumberbatch, also known as Princess Mentality Cosplay, founder of#28DaysOfBlackCosplay and Black Girl Nerds co-host and Cosplay and YouTube star D-Piddy. Attendees pose for a photo in front of the convention center. Learn more about AnimeKon here or at Caribbean 360.